Usage: Ionizing electrodes for gas burner monitoring during intermittent operation in conjunction with flame detectors or automatic burner control units certified jointly with Kromschröder. 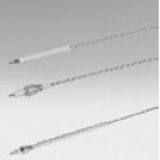 We offer ionizing electrodes for all types of industrial burners. In case of your interest, please fill out a short inquiry form, which will be answered by our sales department in the shortest possible time.